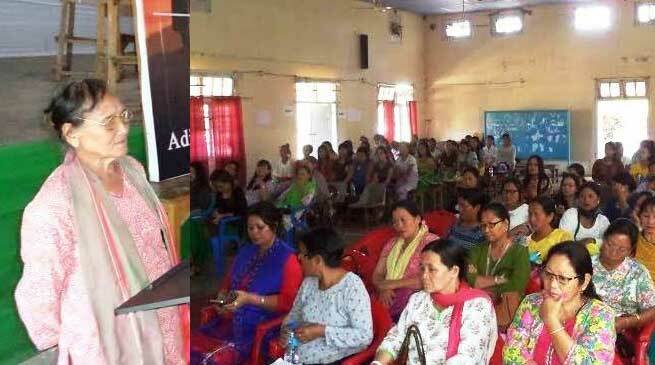 Associate Professor Dr. Priyanka Priyadarshani of Women Cell of Jawaharlal Nehru College (JNC), Pasighat in collaboration with IQAC of the college and East Siang ABK (WW) organized one day outreached program on the topic “Women Empowerment: Challenges Ahead with reference to the tribal communities of Arunachal Pradesh” (Sponsored by the UGC) at the JNC lower campus auditorium. Prominent educationist Bormoti Dai graced the occasion as chief guest while ABK (WW) YT Burang, Dy. Director (ICDS) Ponung Ering Angu, Dr. Jumyir Basar (RGU), Dr. Putoli Langkam (JNC) participated as resource persons. Speaking on the occasion, educationist Dai said there is no denying the fact that women in Arunachal Pradesh have made a considerable progress but their true empowerment is still awaited. “There is no chance for the welfare of the world unless the condition of women is improved in house and workplace and society as a whole. We have to create congenial atmosphere granting women the freedom to make life choices. A woman is a being with senses, imagination and thoughts; she should be able to express them freely. Individual empowerment means to have the self-confidence to articulate and assert the power to negotiate and decide, added Dai. Empowering women to participate fully in economic life across all sectors is essential to building stronger economies, achieve internationally agreed goals for development and sustainability, and improve the quality of life for women, families, and communities. The Chief Guest appreciated the members of ABK (WW) and WASE for their ongoing efforts to create more awareness on ill effects of alcohol, drugs and other social evils. Drugs and alcohol related awareness they spread among the public besides conservation of biodiversity, hass sset example for the state. She categorically mentioned that public were made aware by ABK (WW) about the strict following of Adi customary law as adopted by ABK. Earlier, East Siang ABK (WW) president YT Burang said that every citizen should know about the POSCO Act and Adi customary law and available in book form, called “Adi Kebang Ayon” and being implemented in all banggos in letter and spirit. Quality education should be imparted to the girl children. They are the future mothers and wives. An educated mother can nurture her children well and lead family and social life better. Education ensures protection of women from harassment, however, most women are unaware of their rights as enshrined in the Constitution, she asserted. DD (ICDS) Ponung Ering Angu deliberated on POSCO Act and ‘Domestic Violence’ and resource persons present on the occasion sensitized the women participants about role and rights through power point presentation in technical session.